Just in time for Christmas, I have to say that Chichester Festival Theatre’s production of ‘Mack & Mabel’ is a wee cracker! 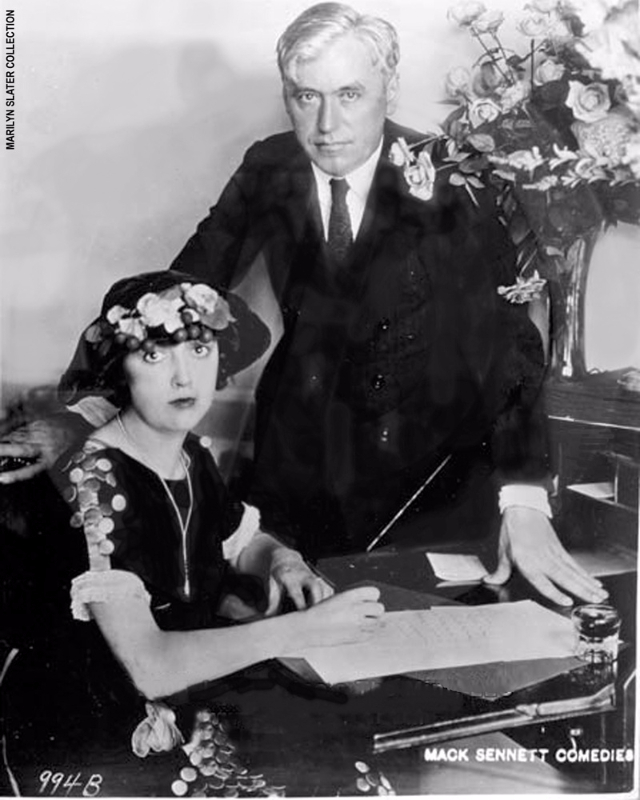 Although I vaguely remember the name Mabel Normand being an actress in the world of silent films, the musical ‘Mack & Mabel’ was a mystery to me- I was deliciously in the dark about the storyline and content and this is sometimes the best way to appraise a show. Well, I can tell you straight that I was not disappointed, and this show has made me want to revisit my childhood rainy afternoons watching silent films, eyes wide, forever in awe of their ability to convey so much without a single word. 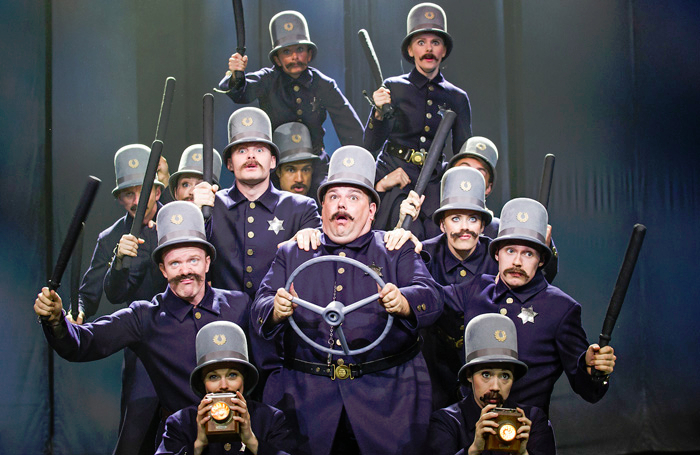 Seeing certain scenes such as the pie throwing or the hilarious Keystone Cops brought a wealth of memories flooding back and I realised that of course all of us who are of a certain age have these timeless images etched somewhere in our minds, even if the responsibilities of adulthood had pushed them away into a tiny corner of our minds. But, I digress- let’s get back to the show: even before the first scene the chipper 20 piece orchestra, complete with black tie outfits and energetic conductor, played in the first act with a lively ragtime tune, flying us to another era on a musical magic carpet (this was especially true as they appeared to float high above the actors, up a vertiginous spiral staircase that seemed never to end, in a clever piece of set by Robert Jones). Musical directors Brendan McCormack and Robert Scott have done a wonderful job with the material provided. The set and costumes were of a high quality, with Jon Driscoll’s film projections lending magic and animation to an often gritty reality playing out below- his backdrop for the scene of the lovers in the train is a memory to cherish. The dance numbers were vibrant and sharp, with the jolly ‘Tap your troubles away’ a reminder to keep up one’s chin in the face of adversity- Anna Jane Casey led this number with flare and confidence, and the balance of music, dance and speaking parts was just right as musicals that are dominated by performance rather than speech can quickly become rather tiresome. This production was conversation-led and the original libretto by Michael Stewart, a stalwart on the musical scene, is second to none, full of realism yet simultaneously peppered with witty one-liners. Now for the music and lyrics: the more well known songs include ‘I won’t send roses’ and ‘Time heals everything’ however they just weren’t what you would call amazing. Although this is a stellar production, and the background music is lovely, I must admit that if I had to choose one aspect of this show that is slightly lagging behind it is the songs- although each one was well-produced and certainly good enough as a stand-alone, after hearing several I’m afraid they all began to blend in to one another and I simply didn’t find any of them catchy or memorable enough to have me humming them and tapping my feet hours(or even minutes) later. When compared with those from other famous musicals such as ‘The Sound of Music’, ‘South Pacific’ or ‘West Side Story’ there is just something lacking, that ‘magic formula’ just wasn’t there. Still, the overall quality of the show was such that this can easily be overlooked and forgiven- it is well worth watching, regardless. The performers were polished and clearly knew their stuff, with strong supporting performances from Anna Jane Casey, Mark Inscoe, Gunnar Gauthery (so interesting to see someone play a young Frank Capra), Timothy Quinlan, Jack Edwards, Rebecca Louis and Rolf Saxon, amongst others, and this production gives all of them a chance to shine and showcase their many talents. 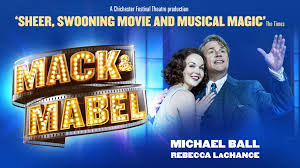 Michael Ball, was someone I had never even seen perform on TV although I had heard many a tune of his on the radio so knew what to expect of his voice but would his acting and stage persona be on a par? Fear not, he turned out to be just brilliant- voice fantastic, acting excellent, stage presence unquestionable, he is the definition of ‘larger than life’ and I found his character, Mack Sennett, loveable, admirable, frustrating and heartbreaking in equal measures…he perfectly depicted Sennett’s deeply contradictory worst enemy, namely himself! It is now clear to me why Ball has become one of Britain’s best loved and most respected stage performers and will remain so, for many a season to come. Mabel Normand was played by the effervescent Rebecca La Chance, and she owned that role perfectly- her comedy timing and snappy delivery were on point with every word, yet during the rare moments when the veil of effusion was drawn open to reveal her private world and her alleged decline into drug use, she was moving and believable, appearing fragile and vulnerable, as though a puff of wind would blow her clean away. La Chance seems made for the part, with her bouncing dark curls, petite physique and bright presence- her extensive experience is telling as she didn’t put a foot wrong. The real Mack and Mabel had a well documented love affair and many said they were the love of each others’ life, and this jumps out of the stage the whole way through the night. Their ultimately unfulfilled longing for one another makes for a beautiful, if sad, story and is never dull or maudlin. Highly recommended for all generations and a fascinating historical insight into the early world of film-making, don’t miss this one!